Welcome to the Crafty Cupcakes Team Stampin' Up! Blog Hop for November 2017. Each month members of the Team take part in our Team Blog Hop to share with you our cards and projects made using the fabulous Stampin' Up! products. 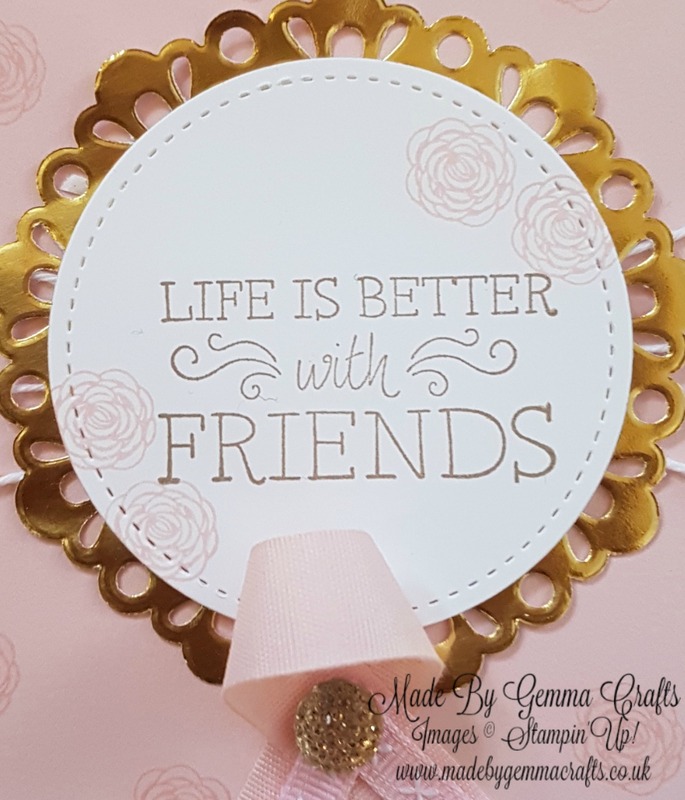 You are currently visiting Gemma at Made by Gemma Crafts in the UK and below you will see the full list of everyone taking part. To move to the next blog just click the name after mine in the list. This month our theme is Thankful,this could be for friendship or love or just about anything you are thankful for. 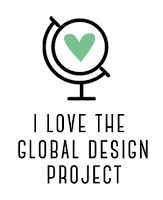 Thank you for visiting my blog today. For my card my thankful feelings are for my friends, whether they be new or old friends are certainly the best! Especially our fabulous group of Cupcakes. I used the Life is better with friends stamp from the Just Add Text set which is perfect for showing your appreciation to who you are sending a special card to. For my card I made a base with Crumb Cake cardstock then chose to use Powder Pink for the front panel. On the Powder Pink I stamped a small flower in Powder Pink ink from the Happy Birthday Gorgeous stamp set all over. I used some Whisper White card to stamp the sentiment in Crumb Cake ink along with the flowers, I then used my trusty Stitched Shapes Framlit dies to cut the circle. I then layered it onto a gold Foil Doily. 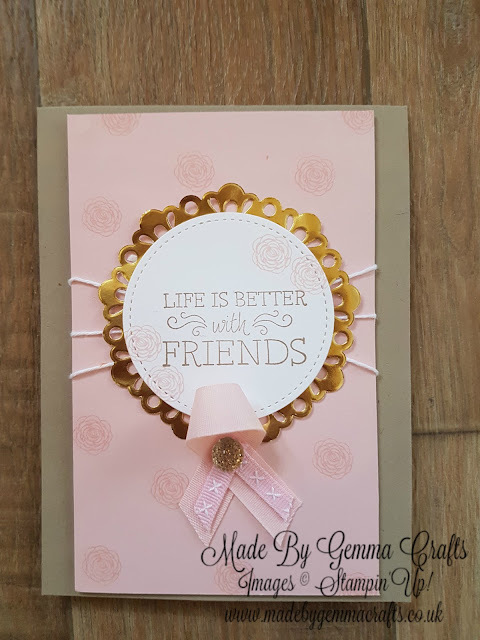 I put some Whisper White Bakers Twine around the Powder Pink layer then finished the card with some coordinating ribbon a gold faceted gem.